I had the opportunity to read this rare, wonderful, witty memoir and I adored it! 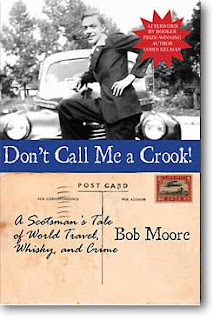 Written by Bob Moore, an unbelievably gifted storyteller, he recounts the many adventures he had traveling the world. In the description of the book it says "The 1920s didn't roar for Moore. They exploded." Whoever wrote that line was not kidding! If you can dream it up, Bob Moore probably did it. I have read Don't Call Me A crook three times and loved it each time. It is so fascinating and wonderfully written. This was such an interesting read, full of adventure, humor, and mischief. The fact that it is Moore's own life he is telling you about makes it even more enjoyable! Boy does this man tell some tales! It left me very curious as to what Bob Moore did with the rest of his life. Information in the book tells us that he is truly a mystery. No one knows anything about him or what happened to him after the book's original publication in 1935. This tidbit adds to the intrigue of this wonderful book. I highly suggest this little gem. !